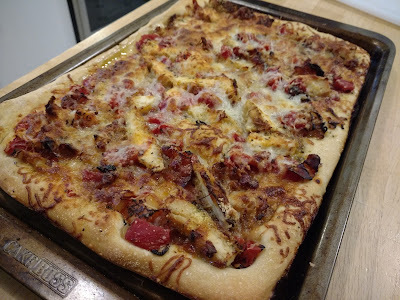 Chicken Parm, Onion and Pancetta Pizza or what I like to call using up leftovers. 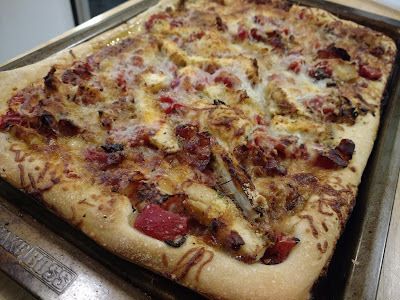 We had some chicken cutlets leftover so Chris suggested adding them to the pizza toppings. 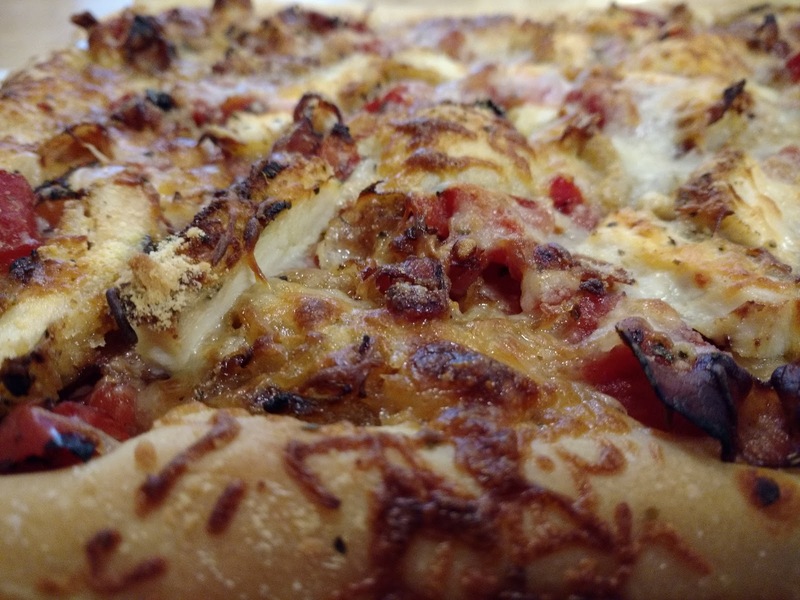 I had sauteed the onion and pancetta earlier today to help the building of the pie move swiftly. The crust was the Frank Lahey recipe. The recipe is at the end of this post. The pie was fantastic. I used canned diced tomatoes, Del Monte Fire Roasted, in place of a sauce. The pie was seasoned with oregano, basil and crushed red pepper. I mixed the crust dough last night and kept it in the fridge. Today I rolled the crust out and put on a baking sheet that was lightly brushed with olive oil. I left the crust to raise for over an hour. Next it was topped with Parmesan Cheese, the tomatoes, the pancetta and onions, more tomatoes, seasonings and shredded mozzarella and more Parmesan. The pie was then drizzled with olive oil. 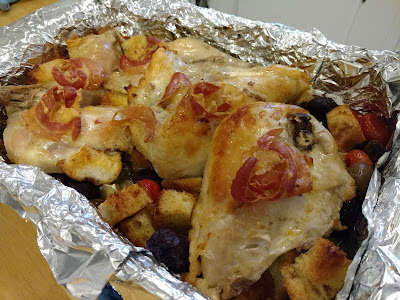 It went into a 450˚ oven for about 20 to 25 minutes. We let it sit for about 5 minutes but could not wait any longer. The pie was then sliced and devoured! In medium bowl stir together the flour, yeast, salt and sugar. Add the water and using a wooden spoon or your hand, mix until blended, at least 30 seconds. The dough will be stiff. Cover the bowl and let sit at room temperature until the dough has more than doubled in volume, about 2 hours. The perfect chicken cutlet on bread with sauce and cheese. How can this possibly be wrong? 8. Heat oven to 350 and then raise temp to 450. 9. Place the tray in the middle of the oven. 11. 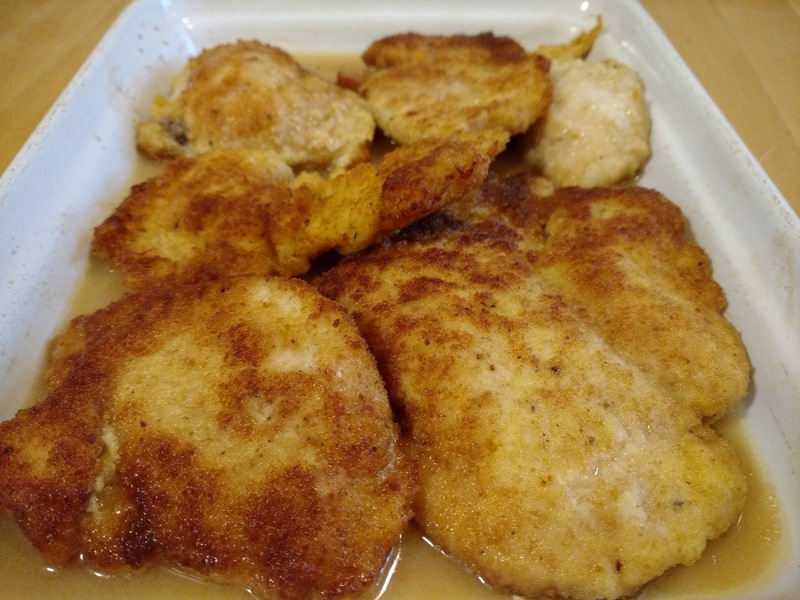 Flip cutlets and bake for another 10 minutes. 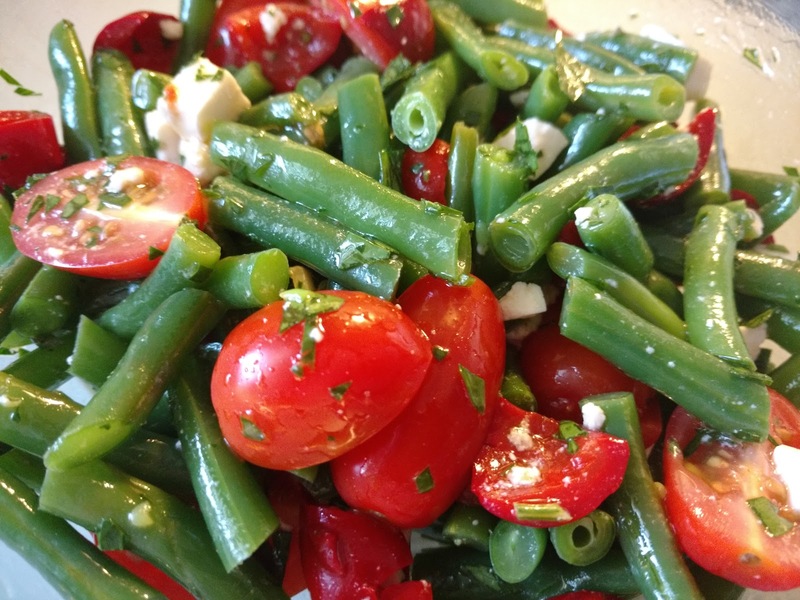 And the side dish was Green Bean Salad. Steamed green beans. Add beans to grape tomatoes, Feta cheese, cherry peppers. salt, pepper, crushed red pepper. 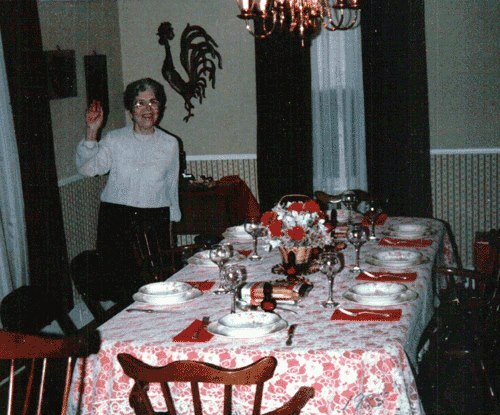 Today marks 11 years that my mom passed. I saw a cardinal in the yard this morning and thought of her. Tonight for dinner I made one of our favorite meals. Jamie Oliver's Chicken Bake. Preheat oven to 350˚. 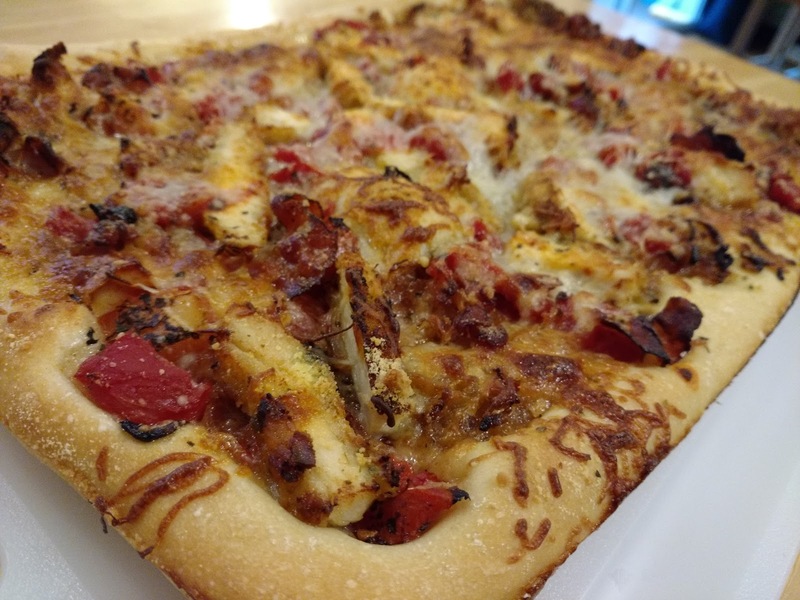 A cut up chicken tossed with olive oil, salt, pepper, and crushed red pepper. Torn up Italian bread. Olives and tomatoes all scattered around the chicken and topped with olive oil. Top the chicken with pancetta slices. Bake for 30 minutes. Turn the chicken and stir the add-ins and bake for another 30 minutes. One more stir and another 10-15 minutes in the oven. So a couple of weeks ago I made the Easter Pies. The crust it the basic Pate Brise recipe I always use with black pepper added to it. Let's just say I made some extra crust to have in the freezer. It is delicious and the perfect thing for any type of filling. Tonight the filling was steak, onions, and cheese. Yeah, not too shabby for a Tuesday night. Sift the flour, salt, and pepper together into a bowl; add butter and shortening and cut them into dry ingredients with a pastry blender or 2 knives until mixture is like coarse meal. Turn dough out onto your work surface and, using the heel of your hand, smear the dough away from you, about 1/4 cup at a time. Scrape up the smeared dough into a ball, wrap, and refrigerate for at least 1 hours. I can not think of an easier dinner. 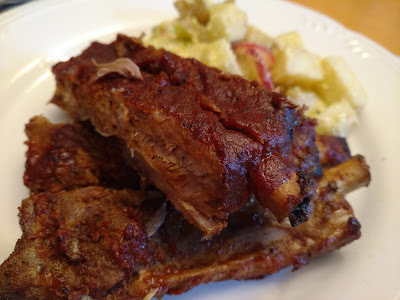 I put the ribs in the crock pot at 9AM and we sat down for a delicious dinner at 6PM. 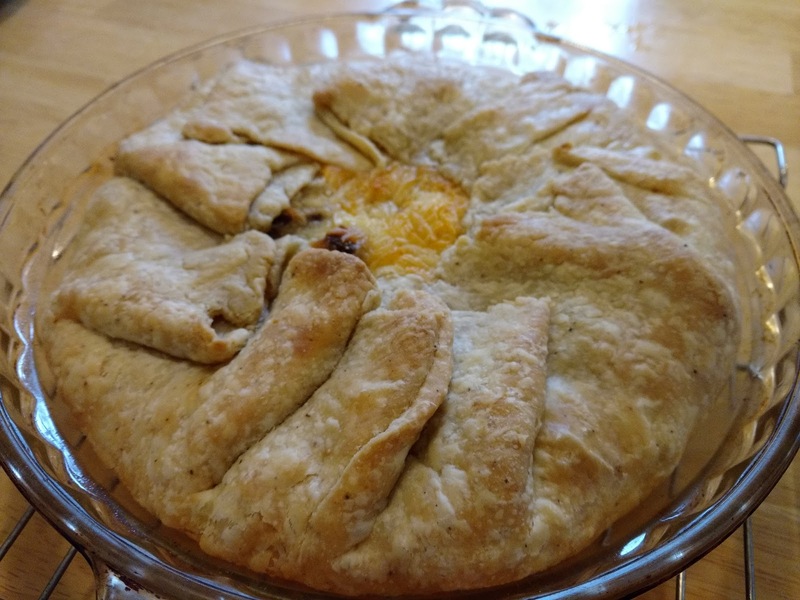 I made this recipe back in September of last year. 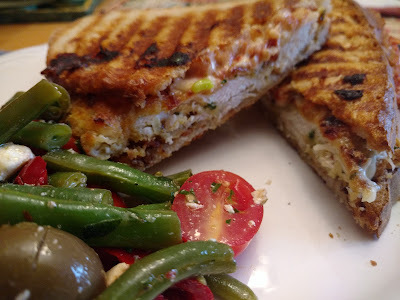 It is from the Stay At Home Chef Blog. Click here the recipe for Crock Pot Ribs. I made a rub of onion powder, paprika, salt and pepper. 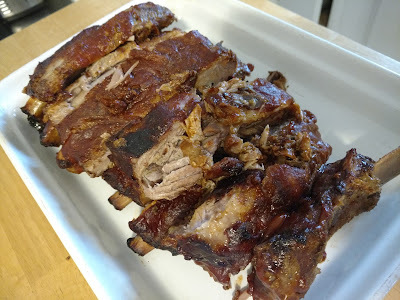 I did not remove the membrane for the under side of the ribs as the original recipe suggests. I brushed both sides of the ribs with BBQ Sauce. I used Stubbs Original. 8 hours in the slow cooker. I removed the ribs from the Slow Cooker and placed them on a aluminum foil lined cookie sheet (easy clean up is so important). I brushed the ribs with more sauce. They went under the broiler set on low for almost 5 minutes. They were tender and the BBQ sauce was caramelized. The side dish was Potato Salad! Steam potatoes on steamer rack set in large pot over boiling water until almost tender, about 10 minutes. Transfer potatoes to large bowl. Cool slightly. Add radishes and onion. Whisk next 4 ingredients in small bowl to blend. Whisk in Parmesan. Season dressing with salt and generous amount of pepper. 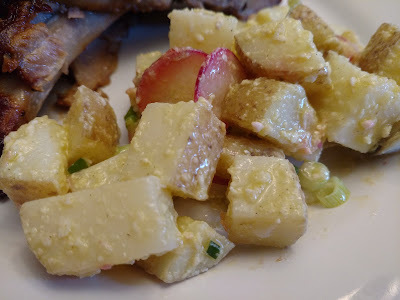 Add dressing to potato mixture; toss to coat. Season with more salt and pepper, if desired. Serve warm or at room temperature. I bought my brother-in-law the cookbook, Cooking with Nonna, for his birthday. 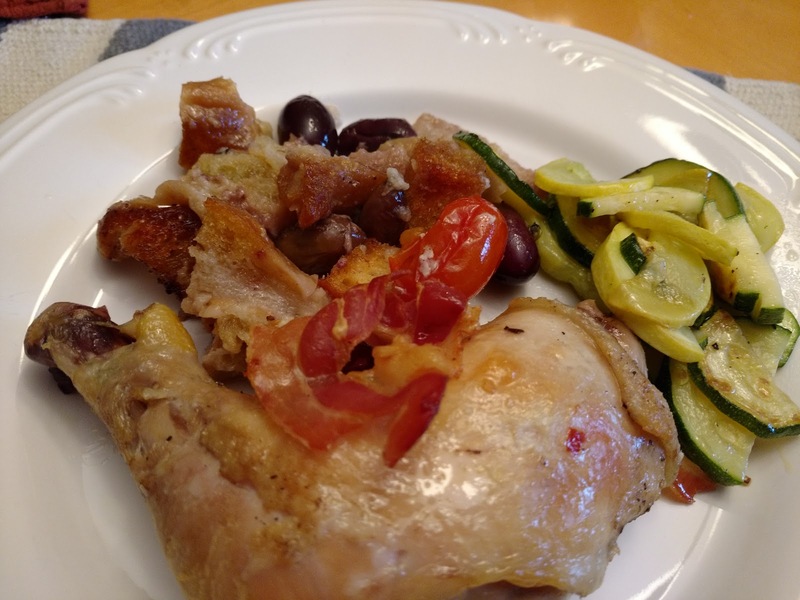 I have been following the Cooking with Nonna blog for awhile. This is where you can find those recipes that your grandmothers and aunts cooked when you were growing up. When I purchased the book for Ralph I got myself the Kindle version. This week we had 3 meals from the book. I will not be putting the recipes on my blog because I think you should buy the book. Sorry, but it is filled with recipes you will want to try. Trust me. 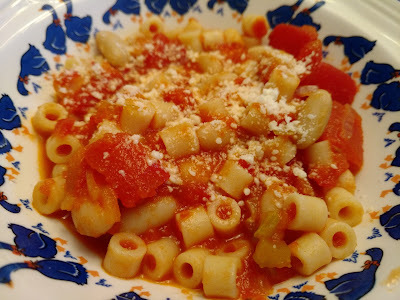 Pasta Fagioli. The recipe in the book called for dried beans. Well, of course, I did not have time to soak and cook the beans so I used canned beans. Wow, this is the recipe I have been searching for. This may be my go to Pasta Fagioli recipe. Lemon Chicken. I can not even attempt to describe how moist and delicious this was. The recipe is similar to the chicken cutlet recipe I have been using but the cutlets are fried. The sauce of chicken broth, white wine, and lemon juice so light and flavorful. And the Stuffed Artichoke. Wow! 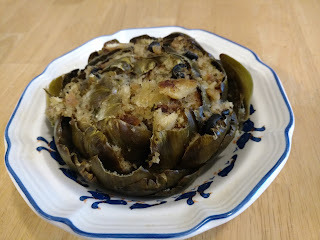 The recipe in the book instructs you to scoop out more of the inside of the artichoke than other recipes I have used. The bread crumbs are toasted, yes I used fresh breadcrumbs. An absolutely perfect dish and Chris ate more of the artichoke than he usually does. Thank you to all the Nonnas that helped write this book. Someone was looking for cookies last night. 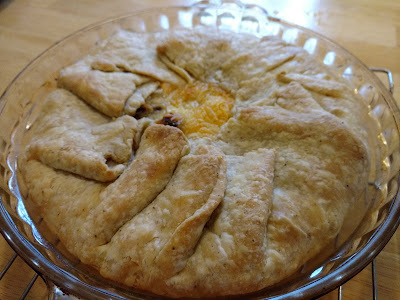 Today I made a new recipe. Literally! 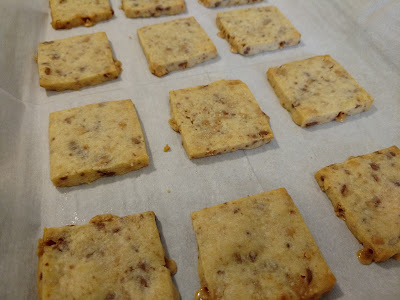 Toffee Shortbread. 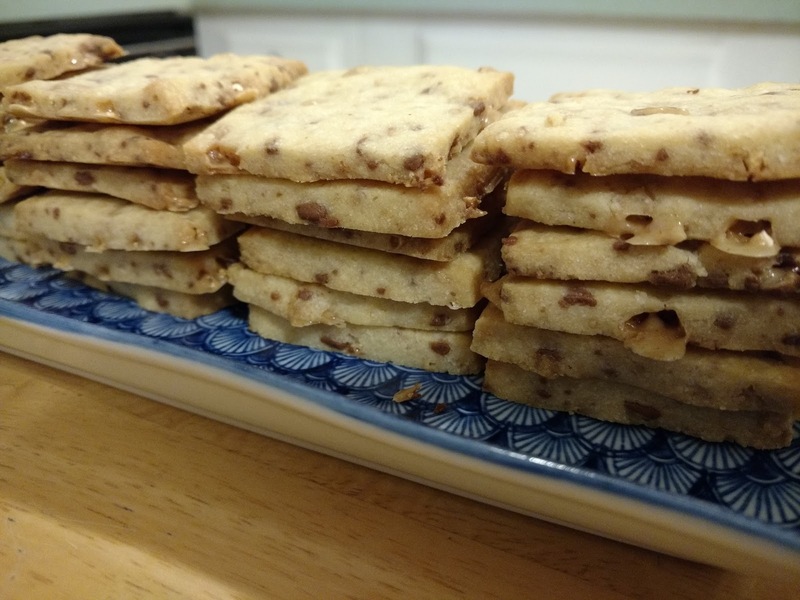 I love shortbread cookies. Shortbread is a blank canvas waiting for whatever flavors you want to add to it. I had some toffee chips in the pantry. I found a couple of recipes to use as guides. This is what I came up with. And damn they are good! Cream the butter in the bowl of an electric mixer. Add the sugar and beat until fluffy, scraping down the sides of the bowl as needed. Add vanilla. Add the flour and salt and mix until just combined. Add Toffee candy crumbs. Combine. Turn the dough out onto a floured surface and flatten into a 1” disk. Roll the dough on a lightly floured surface until about ¼“ thick. Cut out in desired shapes. Transfer to the baking sheet and bake for 10 minutes or until the edges are lightly browned. Remove from the oven and transfer the cookies to wire racks to cool. Purée tomatoes in a food processor until mostly smooth; there should still be some dime-sized pieces remaining. Set aside. Whisk panko, cheese, oregano, garlic powder, ¼ tsp. red pepper flakes, and 1½ tsp. salt in a medium bowl. Whisk in egg and cream. Add beef and mix with your hands until just combined, being careful not to overwork (if packed too firmly, meatballs will be dense). Form into 1"-diameter balls (you should have about 24); transfer to a plate. Heat oil in a large skillet, preferably cast iron, over medium-high. Cook meatballs, turning occasionally until lightly browned on all sides but not fully cooked through about 5 minutes. Transfer to another plate. Cook onion and garlic in the same skillet, stirring occasionally until onion is translucent and begins to soften, about 5 minutes; season with salt and pepper. Add tomato paste and cook until brick red, about 1 minute. Add paprika and a pinch of red pepper flakes and cook until fragrant, about 1 minute. Add sugar, basil, and reserved tomato purée. Reduce heat and simmer until sauce is slightly reduced and flavors have melded about 20 minutes. 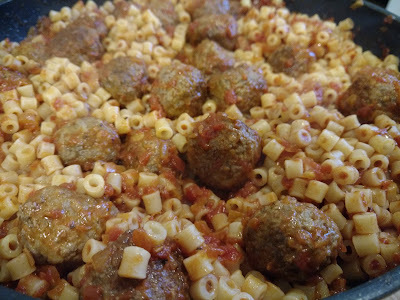 Add meatballs and any accumulated juices; continue to cook until meatballs are cooked through, 5–10 minutes. Meanwhile, cook pasta in a large pot of boiling salted water, stirring occasionally, until al dente. Drain and return to pasta pot. 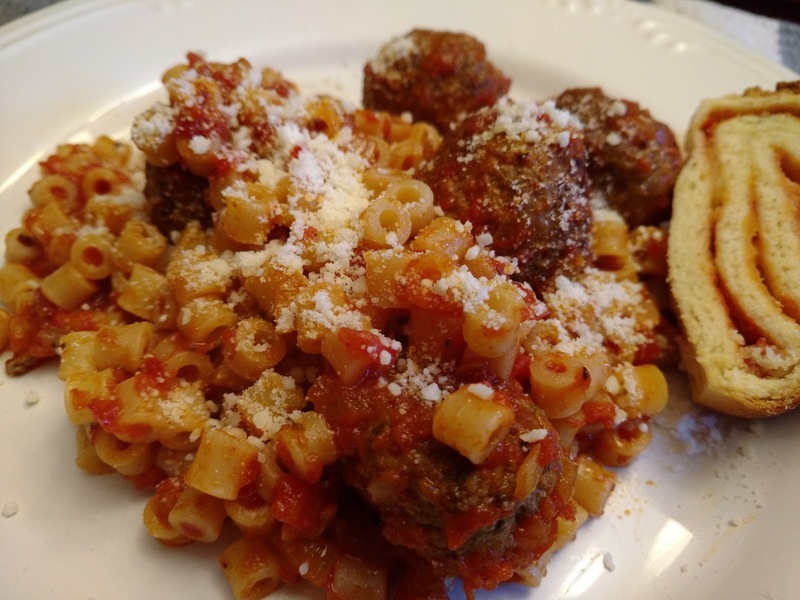 Pour sauce and meatballs over pasta and stir to combine. Transfer to a platter and top with cheese.